Lesson times: Weekend, weekday, and evening group and private lesson times available. Fill out the form below to inquire about current available times. Please note: Lesson fees are paid on a monthly basis and due the first week of each month. All rates include the use of a lesson horse, if necessary. All first-time students must take a private lesson to assess riding level in order to pair the rider with the most appropriate horse. We will also go over the program, where to find everything, grooming, and tacking up the horse. This introductory session is very important as it allows the trainer one-on-one time with the student to promote the highest level of education possible. After this lesson, we will answer any questions you may have and set up a time for weekly lessons. 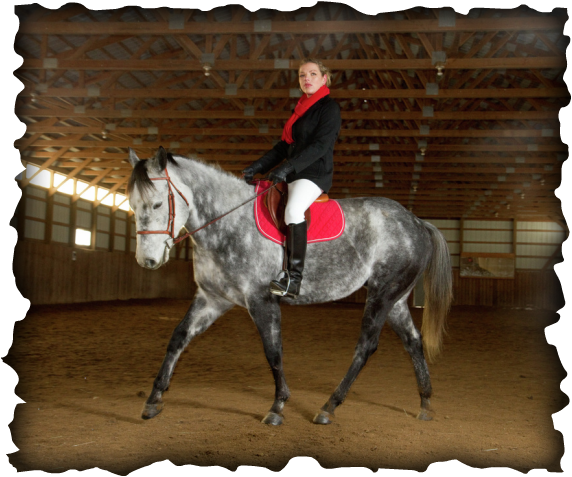 Lessons are focused on learning all aspects of riding including grooming, saddling, bridling, and lunging, if necessary. If you need assistance in tacking your horse, please ask. There's always someone around who can help you. Unless you are a first-time student, riders are expected to have their horses ready by lesson time. Being ready to begin at your lesson start time is very important, so please allow enough time to get your horse groomed and tacked up. And after your lesson, you will be responsible for putting the tack away, your horse back outside (unless instructed otherwise), and cleaning up any messes it has made. We are a community and we all need to do our part to keep our barn looking and smelling clean! If you have additional questions about lessons or would like to set up a time for an evaluation lesson, please fill out the form below. A lesson cancellation policy is going to be enforced, so we are able to accommodate for everyone’s schedules. We understand in certain circumstances it is not possible (this will be a case by case basis), but we are requesting a 24 hour notice. It is then up to the student or parent to reschedule within the month. If you do not give notice, you will lose your lesson. Lesson credits will not roll over unless at the end of the month, as we have limited space. To cancel or reschedule a lesson that you know you will miss in advance please let us us know via email as soon as possible. To make up your lesson please email us to reschedule.